In this infographic by Trulia they asked all U.S. adults surveyed to select every amentitiy that would make them “fall in love” with a home. 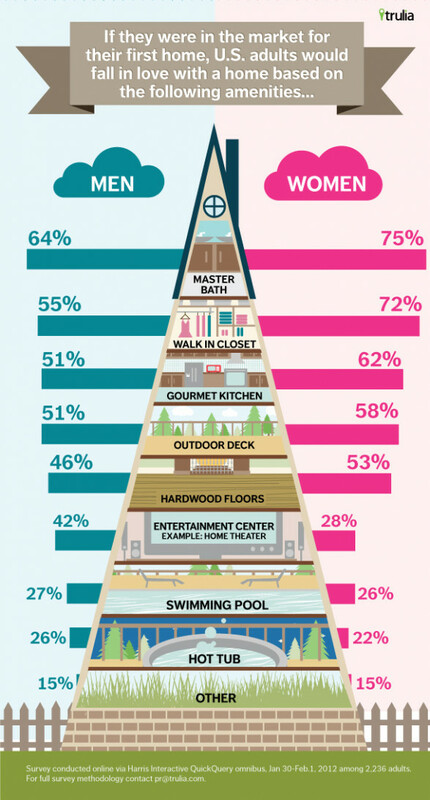 For men and women in the market for their first home the most important part of the home was the master bathroom. And why not? We spend a lot of time in the master bath, often relaxing, but for sure thinking. It stands to reason the master bath is considered one of the most important rooms in the house. Is your master bath something to fall in love with? If not we can build you a master bath, walk in closet and gourmet kitchen worth falling in love with.